Summer has come to a close, the kids are back in school and life has resumed to a schedule of sports and homework. Fall is quickly closing in on us and winter is nipping at her heels. While some may dread the thought of winter others celebrate the thought of snowy activities. Regardless of ones weather preference, the changing of the seasons brings with it a list of things to do to prepare for the winter months. Not being properly prepared for cold weather can have a devastating impact on your home or business. Whether heavy rain, freezing temperatures, damaging winds, sleet or snow, all can cause serious property damage. While controlling Mother Nature is impossible, SERVPRO of Kennett Square/Oxford recommends the following steps to be prepared for some of her worst mood swings. Inspect and clear gutters. Leaves and other obstructions can lead to a damming effect that can lead to roof damage and interior water problems. All water drainage from downspouts, gutters and landscaping should be directed away from the buildings and walkways to avoid icing that could cause slips and falls. Remove and properly dispose of fallen leaves and other debris. Piles of leaves can kill your grass, attract rodents and clog sewers creating a flooding situation. Clear all debris around storm drains. If storm drains become clogged with excess leaves, tree branches and trash, it can lead to storm drain back-ups that flood streets, your yard and possibly your basement! Drain and remove your garden hose and turn off and drain the water to the outside spigot. Leaving a hose attached can cause the water to back up in the faucet and in the pipes just inside the house. If freezing temps hit, that water could freeze, expand, and crack the faucet or pipes. Look up! Are there any branches that are hanging over your home or business that pose a threat if the wind or snow are severe? Having them removed before they come through the roof can save you thousands of dollars not to mention peace of mind in a bad storm. Have your chimney inspected. Before you burn the Yule log, make sure your fireplace (or any heating appliance burning gas, oil, wood or coal), chimney and vents are clean and in good repair. That will prevent chimney fires and prevent carbon monoxide from creeping into your home. Change the batteries in your smoke and carbon monoxide detectors. Working smoke alarms save lives in more than 50% of house fires. Test your sump pump by slowly pouring several gallons of water into the sump pit to see whether the pump turns on. You should do this every few months, but especially after a long dry season or before a rainy one. Have your heating system checked. For a relatively low cost an HVAC technician will inspect your furnace or heat pump to be sure the system is clean and in good repair, and that it can achieve its manufacturer-rated efficiency. The inspection will also measure carbon-monoxide leakage. If you act soon, you’ll minimize the chance of being 200th in line for repairs on the coldest day of the year. Consider cleaning your ducts. Since the ventilation system is often the biggest culprit in poor indoor air quality, inspecting the ductwork should be a high priority. In most cases, the HVAC system has been operating for some time without much attention. Dirty ducts can reduce efficiency, costing you money while circulating contaminants such as mold and irritating dust throughout your building or home. However, duct cleaning may not be necessary. SERVPRO of Kennett Square/Oxford will inspect your HVAC and ductwork and make recommendations about the best way to address indoor air quality issues. Have your carpets professionally cleaned. According to the Environmental Protection Agency, a dirty carpet can retain several sources of indoor air pollutants, including human and pet dander, cockroach allergens, lead, particle pollution, and everyday dirt and dust. Walking across a dirty rug kicks those allergens back up into the air. SERVPRO of Kennett Square’s Showcase Premier Cleaning with Hot Water Extraction removes the dirt and allergens as well as killing dust mites and their eggs. Unfortunately, no amount of preparation can prepare us for the worst that Mother Nature has to offer. 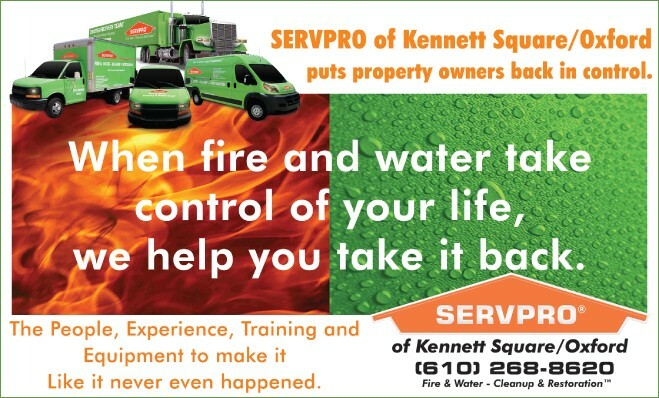 Whether you’ve had a pipe burst because the temperature dropped too fast or the fall rains flooded your basement, rest assured that SERVPRO of Kennett Square/Oxford is available 24-hours a day, 365 days a year to help you get your life back. We have the people, experience, training and equipment to make it “like it never even happened”.